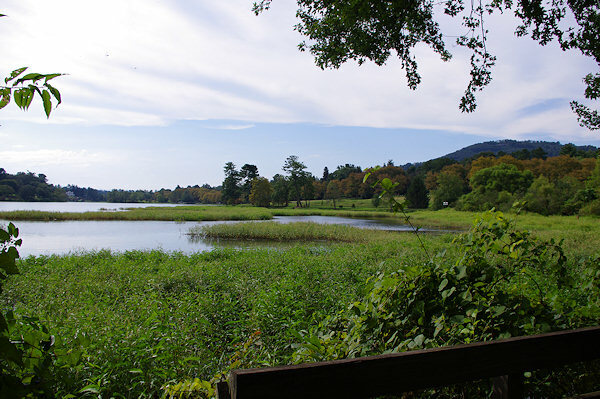 The Beaver Lake Bird Sanctuary is a wonderful wildlife oasis in the very busy north Asheville area. It is a great spot for a evening walk or morning birding expedition. Walk a 3/8-mile boardwalk through a wetland area and by the lake, complete with sitting areas along the way to soak up the views and watch birds. Beaver Lake provides resting, feeding and nesting spots for resident and migratory birds. 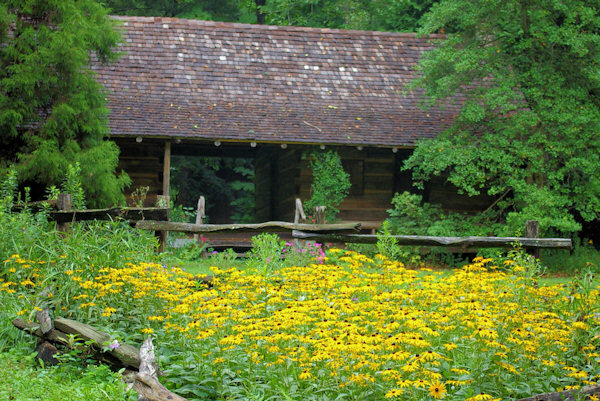 The Elisha Mitchell Audubon Society, a chapter of National Audubon, manages the 10-acre sanctuary. 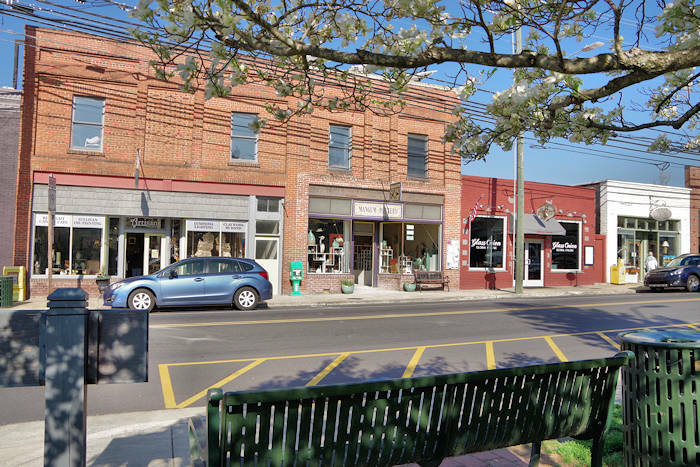 It was established in the mid-1980s, when Audubon successfully led an effort to prevent construction of a strip mall on the site. It's free to visit. For a guided bird walk, stop by at 9 AM on the first Saturday of each month from October through March. From April through September, the walks are 8 AM on the first Saturday of each month. North of the sanctuary, a gravel path follows the lake's edge to the dam and spillway for an extended walk. No pets are allowed in the sanctuary. Parking: In addition to the sanctuary lot, a few parking spots are available at the dam at the corner of Merrimon and Glen Falls. There are no restrooms. Hours are dawn to dusk, and the parking-lot gate opens and shuts on a timer. Beaver Lake Directions: The sanctuary is on Merrimon Avenue about two miles north of downtown Asheville. Take exit 5-A from I-240 north onto Merrimon. In about two miles, look for Fresh Market grocery store and library on left. The small parking area is immediately past the library on the left. To reach the sanctuary from the north on US 19/23, take the Merrimon Ave. exit and at the bottom of the exit ramp turn right onto Merrimon. In about 1.5 miles, you'll see Beaver Lake on the right; the sanctuary parking lot is another .8 mile. The best time for bird watching is late spring through June and late August through October. Birding Highlights: Brown-headed Nuthatch (unusual in the mountains) is often found at the sanctuary or nearby. Warbling Vireo and both orioles have regularly nested by the lake; if you don't find them in the sanctuary, walk the lake's edge toward the dam. Eastern Kingbirds sometimes put on great displays over the lake and adjoining field. In summer, swallows and Chimney Swifts often swoop low over the lake in early morning and evening. Yellow Warbler is common in breeding season. The mature white pines along Merrimon attract Yellow-throated Warbler. Blue-gray Gnatcatcher arrive for the breeding season in late March, and have been seen nesting over the boardwalk. Red-shouldered Hawks have nested in the neighborhood, and Cooper's Hawks have nested not far away. Swamp Sparrow is always a possibility in wet spots during winter and Savannah Sparrow can usually be observed in the weedy field along Merrimon Avenue in late winter. Provided by the Elisha Mitchell Audubon Society in Asheville and compiled by Simon Thompson.